The Daily Beast is also reporting Tuesday that the U.S. will halt its direct aid to the Egyptian military. The $585 million is not technically due until September 30, but officials interviewed by the Daily Beast say that aid will be halted under laws set in place for a coup designation — without ever having to officially designate the July 3 ousting of Morsi as a coup. “The decision was we’re going to avoid saying it was a coup, but to stay on the safe side of the law, we are going to act as if the designation has been made for now,” said an unidentified official. The White House maintains that aid to Egypt is under review and an official decision has not been made. In the latest move to squash the Muslim Brotherhood's protests and influence, Egyptian authorities also arrested the group's spiritual leader on Tuesday. The order came a day after the military-led government ordered the release of former leader Hosni Mubarak, who has been in custody since he was overthrown in 2011. The Brotherhood's spiritual leader Mohamed Badie was arrested in an apartment in Nasr City on Tuesday. The apartment was located near the site of a now defunct pro-Morsi protestor camp, which stood for six weeks before police raided it nearly a week ago, plunging the nation into violent turmoil. Badie and at least one of his deputies face charges of incitement to murder and are expected to face trial later this month. Hundreds have died in the continuing crackdown and three of the Islamist group's top officials are now in custody. Egyptian authorities are hopeful that the arrests of Brotherhood leaders will lead to disorganization and a weakening of the groups resolve, ebbing the protests and riots that have led to clashes with security forces. 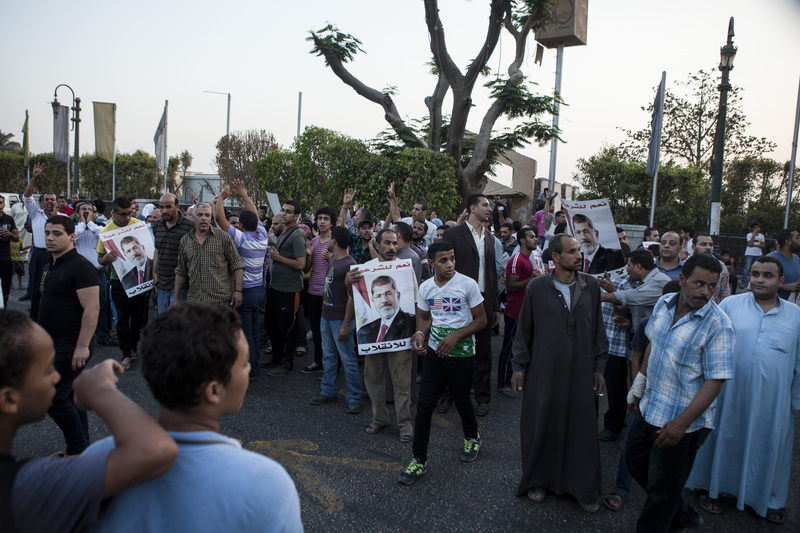 Protests have held steady since July 3 when Mohammed Morsi, a member of the Muslim Brotherhood, was forcibly removed from the presidency. Some see the arrest of Badie and talks of Mubarak's release as further evidence that the new military-backed government could mark a return to the militant rule that sparked the country's initial revolt in 2011. The arrest of Badie comes on the heels of a day of reactionary violence that involved the killing of 25 police officers. More than 900 people have died in Egypt since last week's police raids on protestor camps, making it the deadliest series of clashes since the 2011 ouster of Mubarak.